Royal Enfield, the Chennai-based manufacturer of motorcycles that exude an old world charm, has just launched the new Thunderbird 500 today at the Auto Expo here in Delhi as reported by our undercover reporter few days back. The Thunderbird’s ‘black’ engine is the first of several new styling elements on the bike. It gets a redesigned seat, new lock mechanism accessible through the side panel and true to its touring-friendly nature, it gets a separately mounted pillion seat that can be removed to accommodate luggage. The handle bar has been changed to improve the bikes ergonomics, the pillion grab rail is also new and the bike also gets bungee points to tie luggage. 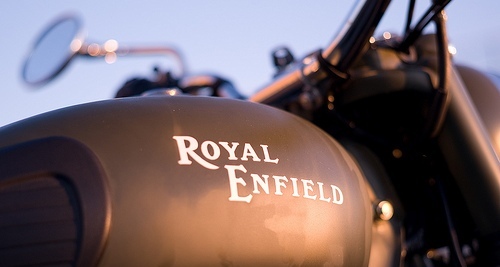 All the new foot pegs, new design mirrors and the LED tail lamp now have the Royal Enfield logo embossed on them. The headlights are really important on our roads and more so for the touring folk. Royal Enfield has endowed the Thunderbird 500 with a new headlight that incorporates a 55W projector lamp for the low beam and for the high beam, it works in conjunction with a 55W halogen. The 500 also gets two digital trip meters to keep a track of total trip mileage and intermediate mileage. It comes with a 20-litre fuel tank and it also gets hazard lamps in the switch gear, which is a first for a motorcycle manufactured in India. Rear disk brakes mounted on the new oval section swing arm, supplied by Bybre, add to the stopping power of the bike. Enfield also showcased the Cafe Racer which is almost in final production form and will go on sale next year. Apart from the bikes on display, the Enfield stall includes biker apparel and riding accessories as well. i love the ride my machine,its called royal enfield!! !